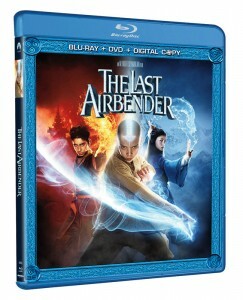 Paramount has announced The Last Airbender for Blu-ray and DVD release on November 16, 2010. Director M. Night Shyamalan directed the film which was based upon Nickelodeon’s “Avatar: The Last Airbender” — an animated TV series that tells stories of the conflict between Air, Water, Earth and Fire, and the Avatar, a boy who can control all four elements. The two-disc Blu-ray/DVD Combo pack will contain over two hours of behind-the-scenes features including a nine-part documentary on the making of the film. Other extras include the featurette “Origins of the Avatar” — following the evolution of the animated series to live action. Deleted scenes, cast and crew commentaries, and outtakes are also included as bonuses. A digital copy will also be included. The single-disc Blu-ray release will contain Origins of the Avatar, Deleted Scenes, and Outtakes all in HD. The Last Airbender on high-def Blu-ray Disc is presented in 1080p at 2.39:1 widescreen format. Audio is formatted in 5.1 DTS-HD Master Audio. View all disc features and specifications for The Last Airbender on Blu-ray Disc/DVD. The Last Airbender (Two-Disc Special Edition) & (Single Disc) on Blu-ray now available for pre-order .